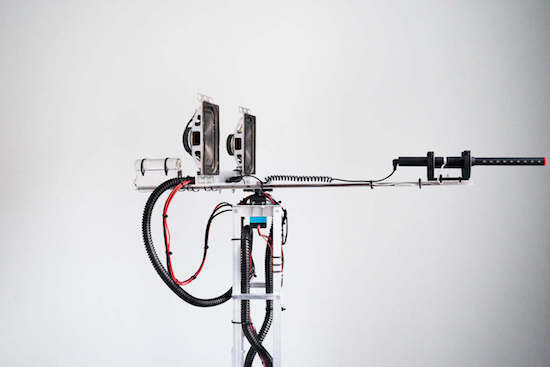 For his latest project, Dmitry Morozov (aka ::vtol::) has created a robotic machine that uses a microphone to record sounds from its surrounding environment, selecting only the loudest ones. Then, the aptly named “Collector” pieces these noises together in the order they were recorded to form an algorithmic composition. First, the Collector records the sounds until it has gathered 100 samples. 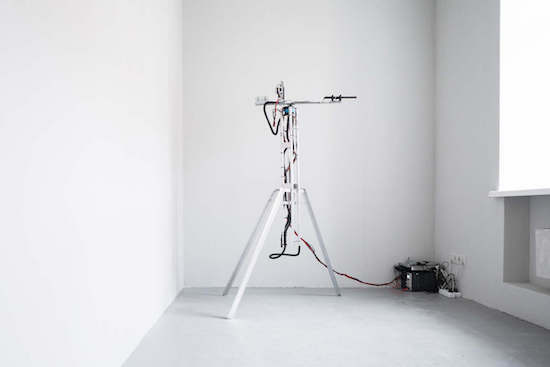 From there, it plays the result as a loop through a pair of speakers for one minute, so they can be heard by those nearby. While in this mode, the recording stops. After that, it erases everything and begins a new search. The Collector is also equipped with an Arduino Uno for a brain, a servo motor for rotating the mic, and a flashlight to show detected sounds or indicate the sounds during playback mode. It is a kind of reality re-mixer–by simply removing the silence and pauses between loud sounds and words, it creates the sense of very rhythmical and organized aural experience, which sounds very musical to me. Intrigued? You can read more and see other photos of the project on its page here.